The corpse of a blog that Andrew Schnorr had during a couple of his college years. A time capsule of dubious quality. Name a Plant, Save a Child! Wikipedia - Information Binges Ahoy! You can thank me later. Happy Birthday. I hope your remaining days are numerous, wealthy, and surprising. May your year reflect the amazing self that you are. Hope all good things come to you, as you so deserve. Hope you learn a lot and arrive on a path that lands you exactly where your creativity is the happiest. Keep writing. Have fun. I am with you in every happy thought throughout today. PS What exactly does that picture signify? What is in the bottle? Signify? It's a Jesuit priest interacting with a dinosaur-like alien. What significance does it need, other than how awesome it is? Happy Birthday Andrew, you are one year closer to death. now blow out the candles that symbolizes life, so fragile. p.s. I don't get it! 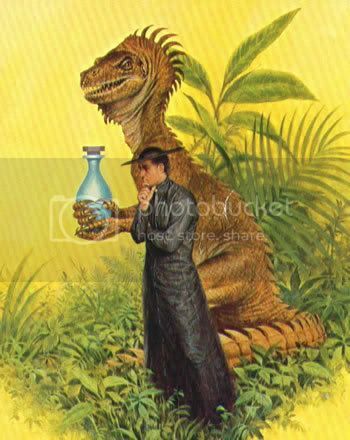 why would a dinosaur hold the bottle of a german priest while waundering through the 1915 Congo? As always, a thought provoking image that leaves a lot to the imagination. Thank you for your presence in our lives!